Julián Gállego (1919-2006), a pleasant and perceptive writer, is the author of revealing studies of leading artists and themes in Spanish painting of the Golden Century and the 19th century. He is among the historians who have made the greatest and most original contributions to the knowledge of Velázquez, through some thirty pieces published from 1960 in the daily press, specialised journals, exhibition catalogues and monographs. He obtained a doctorate at the Sorbonne under the direction of Pierre Francastel, and a fruit of this work was Visión y símbolos en la pintura española del Siglo de Oro (1968, Spanish ed. 1972), a study which revolutionised Spanish art history. He later obtained a doctorate in Spain with a study which gave rise to El pintor, de artesano a artista (1976). He published two important monographs, Velázquez en Sevilla (1974) and Diego Velázquez (1983), and the catalogues of the exhibitions devoted to the artist in the Metropolitan Museum (1989) and in the Prado (1990). 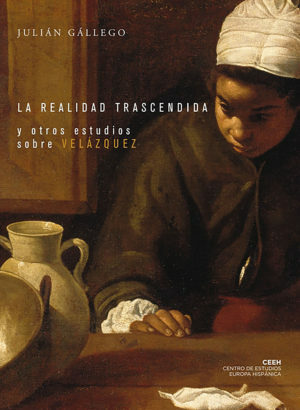 Analysis of the painting and literature of the Golden Century, together with the intelligent reconstruction of the creative and perceptive mechanisms of that age, enabled Gállego to elaborate his well-known theory of “reality transcended”, demonstrating the complex intertwining of significations of the “real” and their frequent supernatural dimension. In these pages, the modern spectator can take stock of the richness of contents – religious, historical, social and moral – that the contemporaries of Velázquez were accustomed to “reading” in his works. They lead us to re-examine the question of Spanish realism, insufficiently understood as an astonishing capacity for imitating the natural.